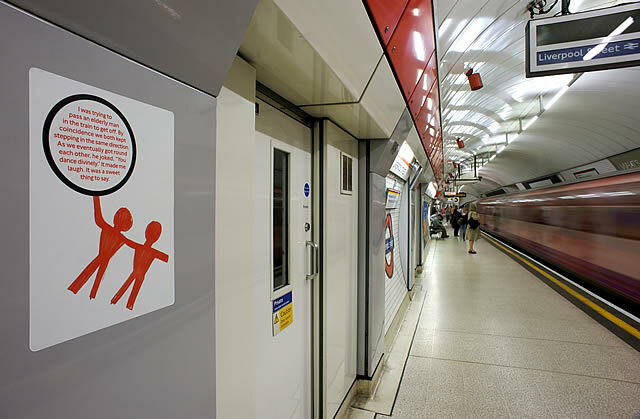 After recent events, it’s fair to say that Londoners might well be in need of something to make them smile on their journeys around town - which is why we love the new Art of the Underground project, Acts of Kindness. 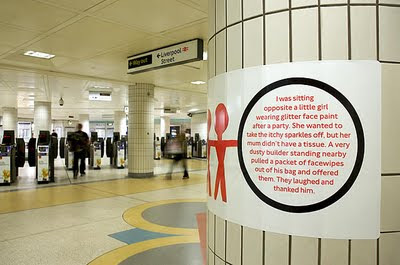 An idea conceived by artist Michael Landy, Acts of Kindness is a project encouraging anyone who’s ever used the tube - Londoners and visitors alike - to share stories of compassion and generosity shown to them by other passengers. Celebrating those rare moments when silent commuters stop to talk and help each other out, the project’s aim is to examine the rare feeling we get on the London Underground of being ‘connected’ to each other. Landy, who defines an act of kindness as breaking out of the “bubble” that we disappear into on the tube and “going beyond yourself to acknowledge someone else’s feelings”, takes all the Acts of Kindness stories submitted and develops them into visual artwork displayed at various stations around the Circle Line. I cried on the Victoria line, last Friday. Boy trouble. When I got off at Stockwell a girl of about 22 came running up to me to see if I was OK. She gave me a hug and looked right into my tear soaked eyes and said 'sometimes you just need a hug from a random stranger on the tube.' As she walked off in the opposite direction I realised she was right. She'll never know how much her kindness meant to me. To read more stories of everyday gestures on the tube that have raised people’s spirits, visit the Acts of Kindness site - and if you’d like to share any encounters you’ve had on the Underground, you can share them with the Acts of Kindness project here. We think it’s a great idea - we might all be in need of showing a little kindness to each other right now!